Mid-Life Cruising!!! 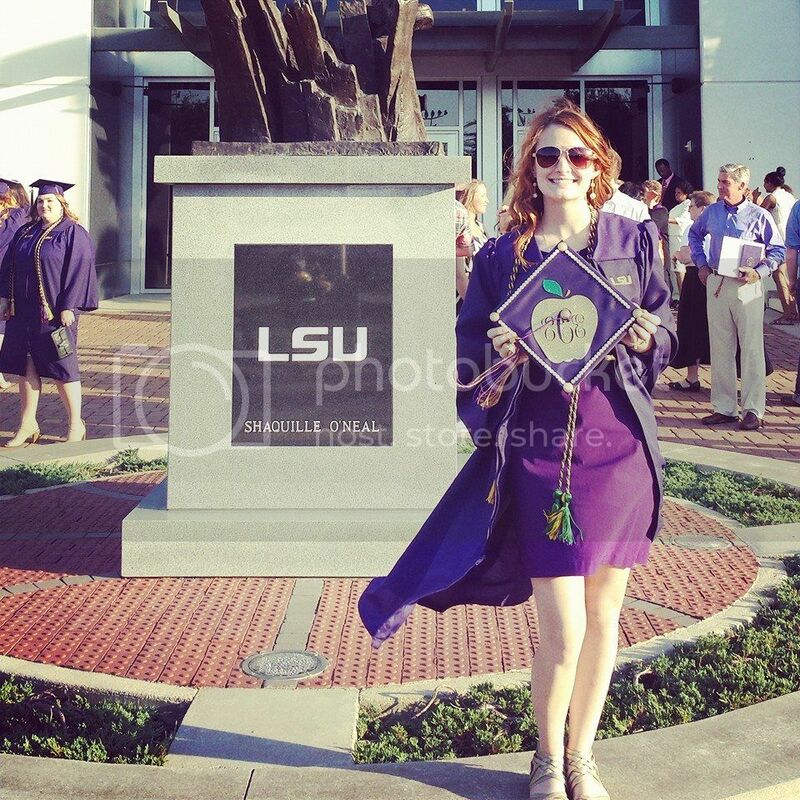 : Our College Graduate! 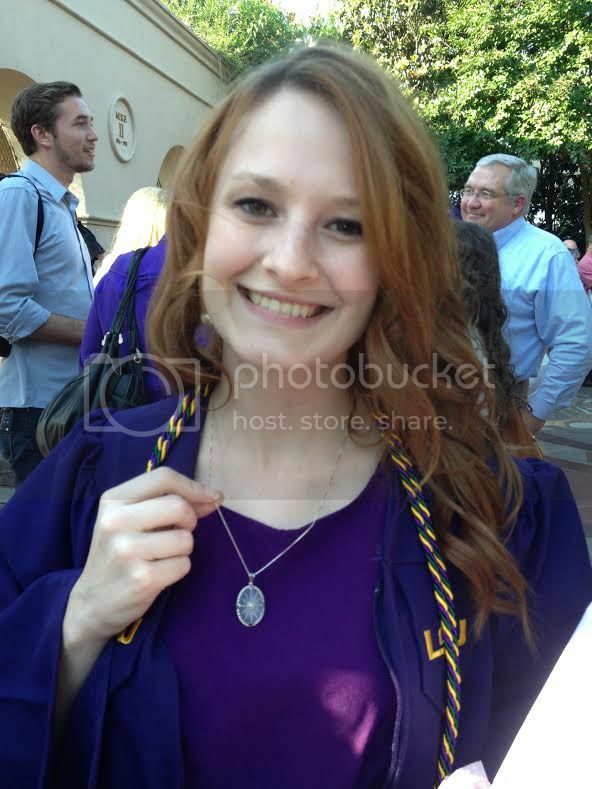 It seems like just yesterday that our daughter got married, and now we've celebrated her graduation from LSU! I tell ya, the past few months have been a blur. This past Friday, (after taking advantage of a day off and pulling weeds from our front garden for 3 hours), I jumped in the shower in just enough time to head to our daughter's graduation with wet hair and no eye makeup ... things need to slow down soon! 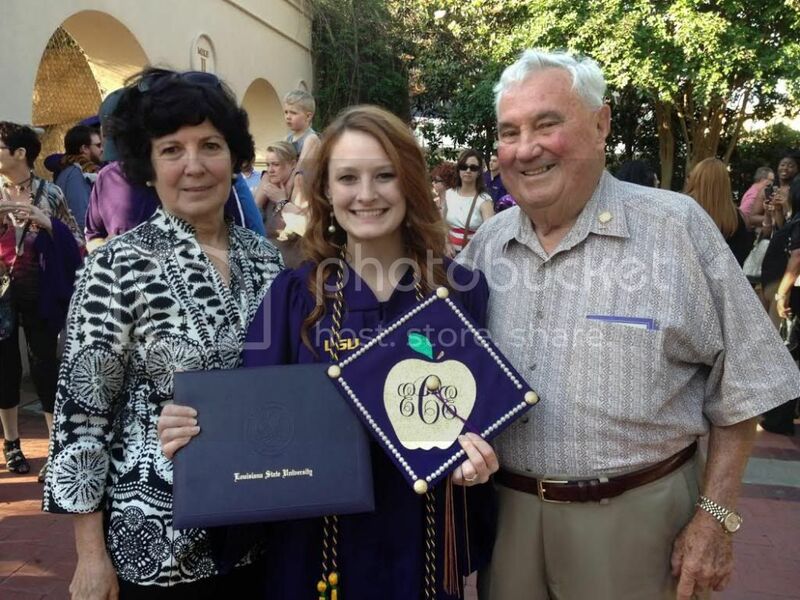 On May 16, 2014, Ken and I watched our daughter walk across the stage and receive her diploma in Elementary Education. 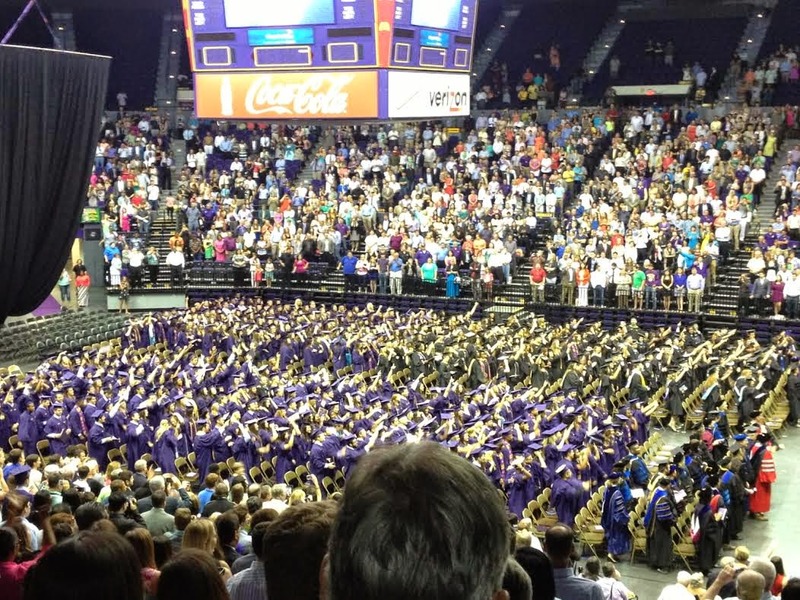 As I sat and watched all the graduates, my mind went back to our daughter's first day at day care when she was three years old ... I cried all the way to my new job. 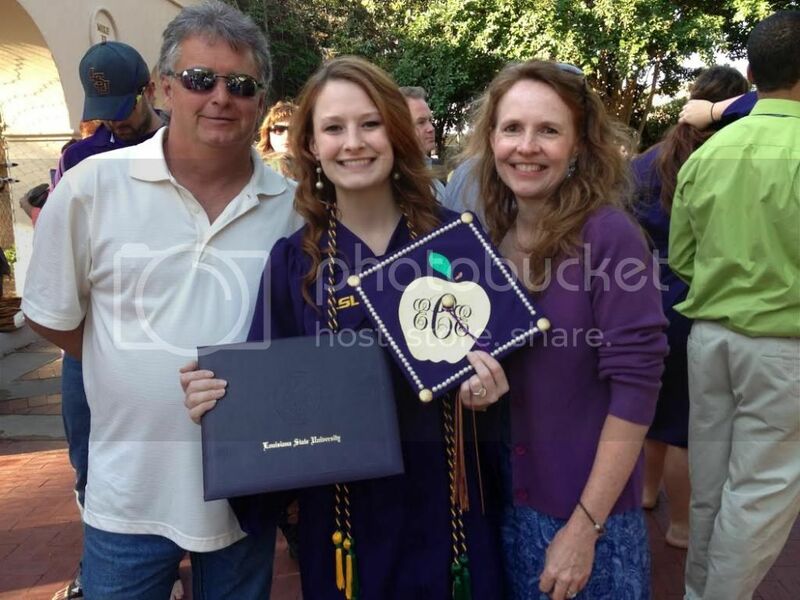 I thought of her high school graduation that seemed about a year ago, and I thought about how Ken and I unexpectedly had tears streaming down our faces as we watched our daughter drive away towards her first semester at college. These thoughts brought tears to my eyes once again as I sat and watched our daughter have her tassel moved to the other side of her cap. Words can't describe how proud we are of our daughter, and she's truly brightened our lives. Our "little buddy" has grown up to be a truly amazing woman. I know a lot of folks say that, but she really is. My mom and step-dad were there to congratulate her. I love the way she decorated her cap ... an apple (to represent a teacher) and her new married initials. My mom gave her a pendant from my great-grandmother that was worn around the 1940's ... so cool! In front of the Shaquille O'Neal statue ... he's so tall I cut him off! Her best friend since elementary school, and her maid-of-honor at her wedding. I'm patiently waiting for those photographer pics from the wedding but here's one that a groomsman took just before she walked down the aisle ... I love this picture! 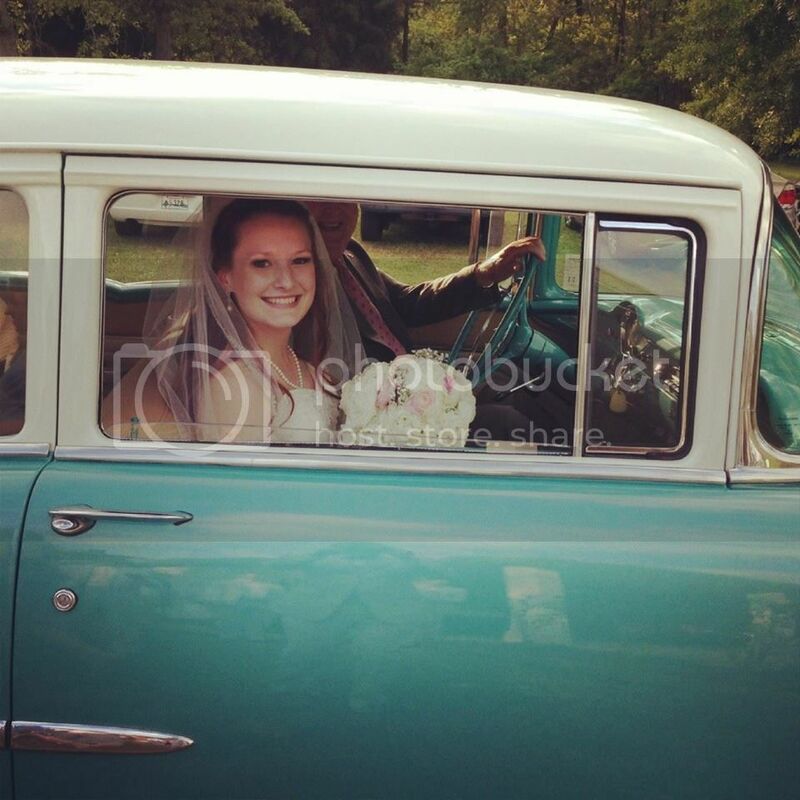 The gentleman driving is the groom's uncle ... the owner of this sweet car. I've said it a few times lately ... perhaps our house hasn't sold because it wasn't time yet. I can't imagine not being around for all of these big events in our daughter's life. I guess I should say, "not being such a big part of these events". We would have been around no matter what, but it's been great being able to help with so many of her life's changes recently. This past week we also helped the newly married couple move their things out of Baton Rouge and back to their hometown of Slidell. I think the timing may work out just right! 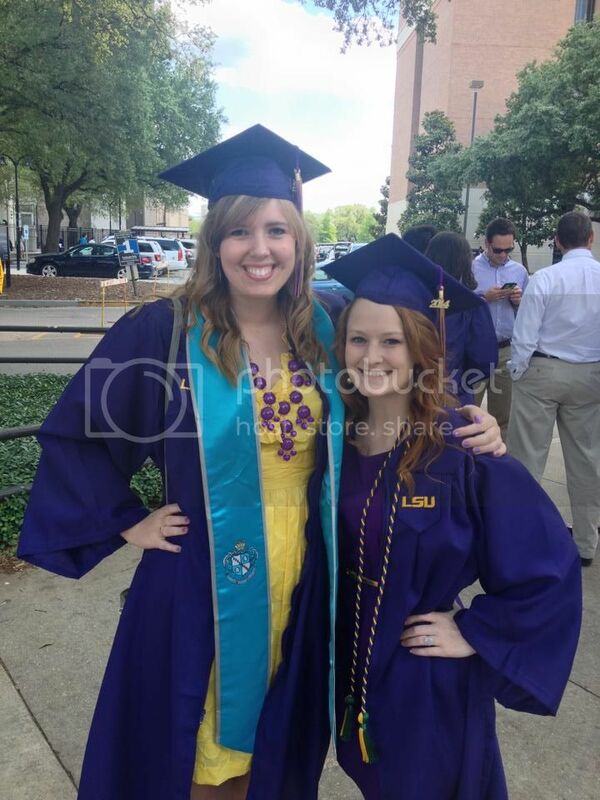 The grad pics are so sweet thanks for the share of something you would never want to miss! You've had a pretty big year! And actually, if you'd been cruising it would have been added stress trying to get back for various functions, figuring out what to do with the boat etc... And you wouldn't have been able to be involved in lot of the planning and preparing sessions. Now you can go!!! Congrats! Seems like you have had some craziness as of late. I bet the calmness of a quiet anchorage with nothing to do sounds great. Can't wait to here those stories too!